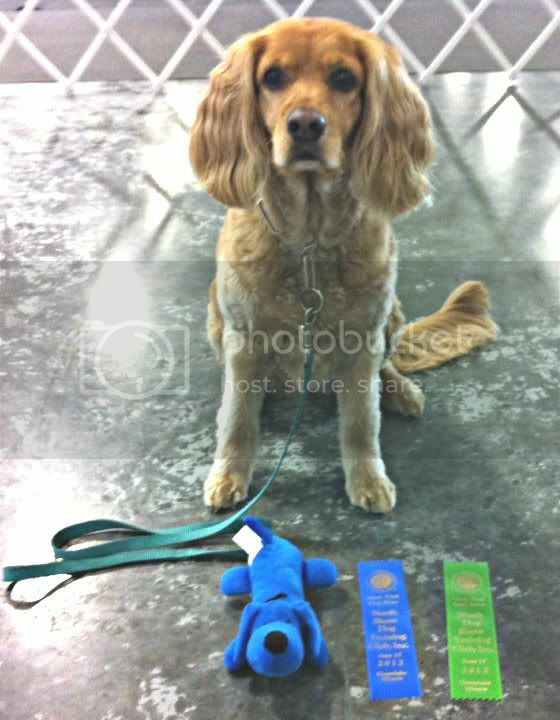 Tomorrow Mackenzy and I shoot for our first leg of Open Obedience (CDX). Sunday we have another round - hopefully our second leg. She does great in practice and I'm optimistic, but dog knows anything can happen. Anyway, we need vibes, especially broad jump vibes. It's been a while since I've trialed, too. We just wanna Q! Thanks guys! I'll definitely post an update, good or bad. Good luck!!! Denis' been trying to find a match for his CDX with Sloan, Let us know how it goes! SUPERVIBES! But I'm sure you guys will do awesome. Thanks guys! I'm getting excited just to be at a show again - yay shopping! I went to this trial 2 years ago and got the first leg of our CD. I remember that I forgot a chair and had to sit on Macky's crate, LOL. *sigh* NQ. I did something really dumb and used an illegal hand signal. There were a few other blips but that was the big one. Oh well. We try again Sunday. Ah, sometimes training ourselves is harder than training the dog. It's hard to keep all of our body parts under control when we're concentrating on other things. No kidding! lol And thanks. 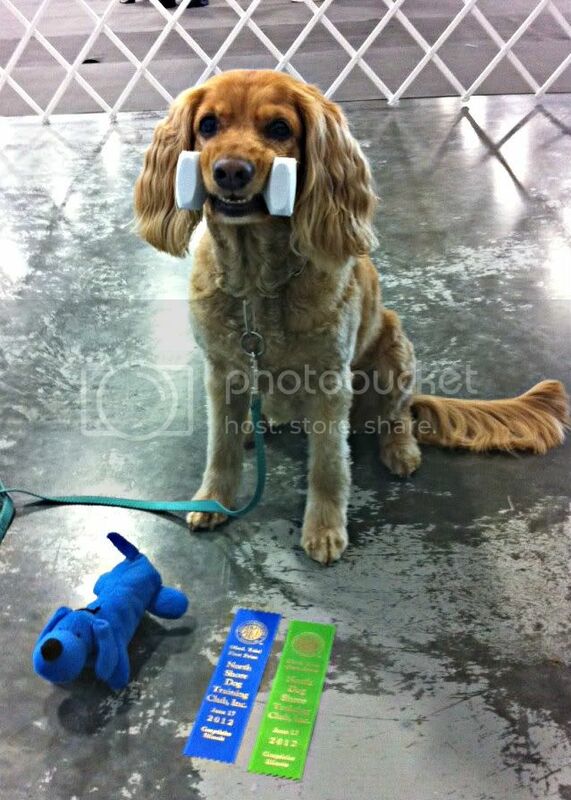 It was a rough class, 12/13 dogs NQ'd. LOL There was a lot of lack of attention and very laggy heeling from most dogs, but I'm proud to say that despite our NQ, Macky was working in drive, happy, attentive, and having fun. Our heeling was the best it's ever been, and she galloped out and back for her retrieves. <3 So you know what, we had fun and my dog was trying her heart out. That's all I can ask. Oh and also I threw the dumbbell INTO the high jump the first time, and I had to re-throw. LOL. I told the judge he might want to wear a helmet when I was throwing. Aw sad days. I'm reasonably certain that I will do that like ninety million times should we ever get to a competing point. >.< Sunday will be better I bet. Boo. You'll do better and Macky was happy and thats what definitely counts! What's an illegal hand signal though? Macky was working in drive, happy, attentive, and having fun. Our heeling was the best it's ever been, and she galloped out and back for her retrieves. <3 So you know what, we had fun and my dog was trying her heart out. That's all I can ask. Best of luck on Sunday! Keep those hands under control! *sigh* I held my hand up until she dropped on the drop on recall, which you can't due. You can only signal the drop and then put your arm back down. The stupidest part about is that she has a very reliable verbal "down" I could have just used instead. I mistakenly thought it would be cute to do a shot with the dumbbell, but she just made a face like a gap-toothed hillbilly. So, yeah. Much improved today.